At the dawn of the graphical Web, Nimoy was boldly going where only a few other photographers had gone before. Julio Ojeda-Zapata, a technology reporter and blogger with St. Paul, Minnesota’s Pioneer Press, dug into his newspaper’s archives today upon learning of the sad news of Leonard Nimoy’s death. He wrote a couple of articles about Spock back in the day, beginning with a locally flavored piece that must be logged at the opposite end of the technology spectrum celebrated in Star Trek. Nimoy is among a growing number of photographers who are pursuing a digital strategy for achieving greater [photographer] exposure. 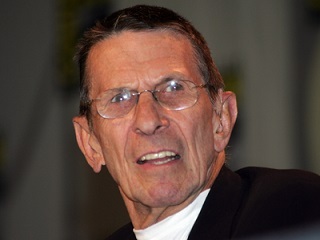 This month, about a dozen of Nimoy’s nudes are being exhibited on a St. Paul-based World Wide Web page dubbed “F-64” that is the online equivalent of an art gallery – a site that selectively displays the works of accomplished photographers in a gallery-like environment. Ojeda-Zapata is promising to share the other Nimoy piece he wrote shortly. Read the rest of the first one here. FYI, the publishing use of the photography lens-aperture term “F-64” (or f/64) dates back many more decades. To wit, check out this manifesto published on behalf of a 1932 group that included Ansel Adams.